Ithaca, NY - It didn't take long for the Indoor Season in New York to get into full swing. Each year, Jessica Lawson (Corning) has followed the same routine. Continue out the XC strength for one more week, and pop a strong performance on the track, before taking a long break. Last year, Lawson ran a 1500m tuneup the week of NXN, in anticpation for Foot Locker Nationals that following weekend. That mark was a 4:39.61, a completely legitimate mark heading into Foot Locker the following weekend. One year later, and Lawson has blown that mark out of the water. One week after taking 8th at the most competitive Nike Cross Nationals in recent memory, Lawson took to the track at the Ithaca College Bomber Invitational. There, she would lap the field, throwing down a monster winning mark of 4:26.44. How good is that? It now stands as US #24 All-Time, and even more importantly, it shoots Lawson right up to NY #3 All-Time! The only two athletes ahead of her are Molly Huddle (who holds the Section 4 record), and Mary Cain. Cain has a 4:11.72 to her name, as well as a 4:06.63 if you count marks run as a professional. Huddle's mark was a little bit closer, at 4:22.1, run at the Cornell track back in 2001. If Lawson's marks is any indication of what's to come, Huddle better watch out. Come March, Lawson may be quite thankful that the State Meet has left her home section, and the country's fastest track will set the stage for States. What better time to go for some records? Jessica Lawson wasn't the only athlete dropping a bomb on the early rankings in Ithaca. 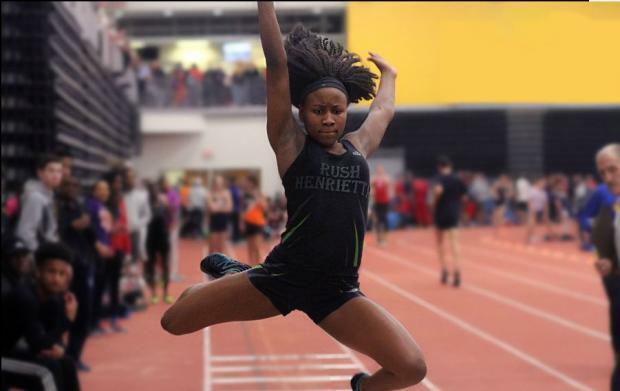 While teammate Sammy Watson (Rush-Henrietta) has been having one of her best XC Season's ever, Lanae-Tava Thomas has been prepping for the indoor season. Consider the preparation paid off, as Thomas woke the country up with two dominating marks. Over the 55m dash, Thomas hit 7.04 in the trials, than took home the win in the finals with a 7.07. The mark ranks as US #1 for 2016-17, leading the nation once again. But that's not all. In addition to aiding her team to a win in the 4x200m, Thomas took to the jumping pits as well. With her win in the sand, Thomas is now US #1, the first girl over 20ft in the country, winning in 20-1. The mark is only two inches short of her personal best of 20-3, which stands as NY #4 All-Time. Thomas mark from today would be #5 All-Time, but we expect that to improve. She'll be chasing the junior state record (which is also the overall) of 21-1.25 held by Keyon Soley of Uniondale.